by donkeys, small "bajas" which are like a motorcycle pulling a wagon that holds 3 thin people, cows on their way to graze and hundreds of people walking everywhere. When I come home to Long Island, there is no one walking unless they are on an exercise plan. New cars stream by with lights or stop signs on almost every block. In Addis Ababa most cars are over 25 years old and there are only 7 stop lights for a huge modern city of 5 million people but now with highways and asphalt roads. Life in the countryside is generally the same as it has been for a LONG time. Farming is the same in Ethiopia for hundreds if not thousands of years. Children go to school where their "exercise book", which is a book to copy from the board and a mandatory pen. There are no book reports because there are no books to read. There are no pages of ditto worksheets for homework because there are no copy machines or electricity or paper in classrooms. When you buy coffee at the market, someone has to spend hours picking out every bean because it just came from the farm and has stones and small twigs in the one kilo bag. Now let's think about technology. In NY everything is wireless, our houses, stores. Almost everywhere you go, you can get WiFi. In Ethiopia the government offices use cables attached to the computers for better antivirus protection and more reliable service - except when the electricity goes out, which is often- and then they just sit and wait for hours to get back to work. We want to bring the people of Hosanna a way to connect with the world beyond their farm and rural city- to a world with millions of people, different cultures and ideas and access to unlimited knowledge and skills. HOW? Through technology! We have built into the community library a large computer room now filled with tables and chairs. We have 5 computers to start but we are ready for 23. Then a whole classroom of students can come in at once. Then the high school students, who come to study, can spend some time doing research and learning to surf the web. Then the library visitors, who want books that we don't have, can find information on the internet. How amazing is this! We can be there for everyone. I was lucky to meet a man who can network them all, put in education software and install many sites that don't require the internet. The town is hiring an ICT expert to manage / train the users. We can transform the lives of these talented yet isolated people, to bring them skills and knowledge that they can use for themselves to solve their own problems and transform their world. Every time I visit, the library children come to me and say, "I heard you were getting us computers. When will they be there?" One of the experienced teachers told me "I just want to have my hands on a computer before I die". The head of the education bureau told all the town's educators at an official meeting that we are getting them all computers so that they can bring the children and teachers into the 21st century. I am hoping we can develop this VERY soon and am VERY excited to see the children and adults gaining new skills and knowledge and making global connections with us all. This is the exciting email I just received from Wolde, our country representative, supervising all our programs in Ethiopia. Amazing ideas are coming from users of the library because of our library construction in Alemu W.Hana School. You know, all permanent and other users of the library from high schools, elementary and community asked the Alemu W.Hana School director to give a day of recognition, "Library Day". He accepted their ideas and the readers formed their own committee and are going to different institutions, community and households to ask for more books and at the same time promoting how this library helped them and will help for researchers and other knowledge . Wolde Ermacho, the director, came to me with a letter of request for me to be a representative on that day. The date of recognition with special appreciation for Library Day and h2 Empower is going to be on June 13, 2015. All of this is the result of your hard work and donors efforts. This morning we celebrated library day in your library. What an amazing ceremony it was! Students brought their own books and contributed them to the library. They had a very good coffee ceremony. They praised and gave gifts to the 3 librarians. Many many funny things the students did on their side. The Education Office representative and me made a speech. On my side, I shared how we developed this library, the problems we faced, and success of today. I appreciated them and fixed June 13 to be Library Day always at Alemu Woldehanna Library. I am thrilled beyond words at this development. It is a dream come true. I always was worried if people would come to the library and use it? It is the youth that leads the way. We want to expand our programming to maximize library use and effectiveness. To accomplish all of this and to expand our services we want to train all the school librarians of the 40 schools that received books from us. Please donate to help us make all this possible. It has been a long time since I have written a blog. I am way overdue. I have been so busy doing things, I just couldn’t stop to write about it. Now I am back to normal, if that is even possible. I can’t stop thinking about these children. Once I saw them, those innocent faces, looking at me with a distant longing. I saw the possibilities for them. I saw the potential. We never know what they could accomplish for themselves or their families or their country. But now they wait, taking care of their cows, doing household chores, asking for a chance to have a better life. What do you see when you see this picture? Cute kids, smiling, and holding up a sign. Did their teacher’s write it for them? Is this staged for an American to tug at the heart strings? Do they even know what the sign says? Maybe yes to all of this. Let me tell you about the context of this picture so you can imagine the pangs in my heart. I asked the man next to me where this school was and if he could take me to see it. He said, “You can’t get there. Can you ride a horse?” I answered, “Yes, if you can get me on the horse and off the horse”. Or maybe you can take me in your motorcycle.” He looked horrified. But to make a long story short, we got the town truck and made a visit to that school and another equally remote school. Both at different corners of the town. But it was not really in town. They both were in the fields, surrounded by farms or small huts with many families – a few miles from the main road. One school was surrounded by potato fields. They will sell the potatoes to fund a building project they are doing. They were building more classrooms and had a nice library room there. The principal met us with the community leaders, the outspoken teacher and parents. They had drinks and a wonderful thick homemade bread for us. Everyone gave a speech sharing their dreams that this school could one day even be a university. After the sharing of food and sharing their ideas, they did the ask. “We need water and latrines for our children. We need electricity and we need a road to the school.” There was certainly no dispute. They needed all of that. But I can’t possibly do all of that. For me, this was such a common experience. Seeing great needs, and people looking to me, an American, to help - not for them personally but for their community. People aren’t asking for me to give them personal money. But people are asking for the children. And what they are asking for is truly needed. This is also when I feel helpless. I don’t have that kind of money to solve all these problems. But I do have ideas and connections. And maybe we could think of something. One the way back to the main road, we talked in the car. The head of the education bureau, Fikre, was there, witnessing the needs with me and seeing the eagerness in the community. He told me, “you can’t build the roads but we can see what we can do together. You can’t bring electricity but we can see what we can do.” Then he stopped. We had just put in water in another school in another part of town. It seemed like we were all thinking the same thing. I knew what I had to do next. We headed to the next school, another remote location, in another corner of the town, far from the main road. This one didn’t have big farmlands, but small plots with small homes and people carrying water jugs, or wood, or bundles of things to sell. When we finally got there- Yes- there was land, growing some wheat to sell. But this school was small, and the area for the school was smaller. The fence was half open so a small goat could easily come visit the kids. We headed to meet the principal. He had been waiting for us, sitting behind a large desk surrounded by charts on the wall describing the statistics of the school, Amharic inspirational sayings, and bags of books. Leaning on his elbow, he welcomed us and invited us to visit the classrooms. We waited while the guard unlocked the classroom door. There was a tiny room with a few bench type desks. The mud walls were thick and darker than usual. Probably because there was only one window in the back and only a bit of light shown through the cracks of the wooden cover. There is a standard size for all classrooms in Ethiopia. The principal explained that they had cut the room in half so that they could fit more classrooms in the school. 40 students were assigned to that room, a room that could comfortably fit 15. The rest of the school was in the same shape. 4 tiny rooms that housed 400 students in shifts. The latrine was open on all sides and the blackboards were broken. There was no library or laboratory or staff room. The floors were made of dung. A few months later we were given a demonstration of what a dung floor meant when a girl was washing the floor by hand and rubbing the dung to smooth it out and keep the bugs and dust from coming into the classroom. We were also to witness the community leader pour the river water into a glass so we could see how they get their water. A clear glass held a brown thick liquid. It was mud. This is what they drink from. No wonder the children looked sickly. This poem was written and presented by an 8th grade boy from a remote school. He wrote it and read it in English which is an incredible achievement. Today is not the past. You need to make a difference. Hot and dry, day and night. This boy's mother has died. His father is a poor farmer and he has 5 siblings. His small village is too far from high school. He needs to live in a town with a high school and this takes some funds which the family doesn't have. For $200 a year you can sponsor this youth to attend high school in the town. Consider sponsoring this bright boy. He could have a very bright future. You can make a huge difference in his life. It has been 10 years since I completed a year of living in Ethiopia. Most of my friends were shocked or amazed that I could do it. But I was excited and grateful to be living in Ethiopia every day I was here and am still. The people are beautiful, inside and out. The students are so eager to learn, Education is a priority. The teachers worked tirelessly in unbelievably difficult circumstances. I learned more that I was teaching. I learned about the meaning of community and the importance of slowing down and talking together. I learned about the value of family and responsibility and hard work. Despite the many challenges of life, everyone was friendly, smiling and welcoming. How do they do it? I knew how fortunate I was. I also knew that I could work to share any resources I had with my new friends. Sharing my discoveries with my friends and family, brought terrific support from all corners. My daughter was the first to connect with a business in the US willing to donate funds and when I went to the largest school in town and asked the teachers what they wanted, they said, " A library". So it was settled. We would work toward that goal. But this library would be for all the community. It would be filled with all types of books, both English and Ethiopian languages. It would enable young and old to expand their horizons and find ways to solve their own and community problems through access to information. Computers would also be necessary. But how to do this. I knew it wouldn't be easy and I had to have someone on the ground who could make this happen. It took only a few moments thought to figure out how that would have to be. I met Woldeamanuel at the Hosanna Teacher Training College where I was living and doing teacher training. He willingly drove me into town that day for my first ride in a Russian car. He was full of ideas and enthusiasm and possibilities for making life better. I was captivated by his energy, his vision, and his dedication to improving living conditions in Hosanna. 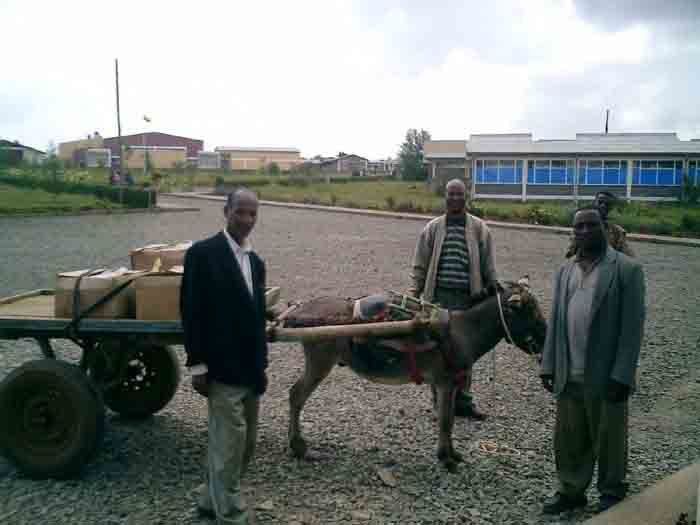 Woldeamanuel eventually agreed to help us in our work on improving education for the 27,000 children in Hosanna Town. Yearly we came to do primary school teacher training, conducting training for 95-200 teachers at a time, sent books to 40 schools in the Hadiya Zone, and the big effort was building the library. It is hard to imagine what this involved. Picture Woldeamanuel going back and forth to the capital and back over and over again to get documents to allow the container of books into the county. Picture him jumping into his car and getting others to join him to lead an 18 wheeler truck filled with 30,000 books out of a ditch and connecting the cab with the container, miraculously getting everything to Hosanna in one piece. The building construction was fraught with complications between contractors, engineers, town and school. Getting parents, the town and the Zone to contribute financially and making sure the building was constructed properly. 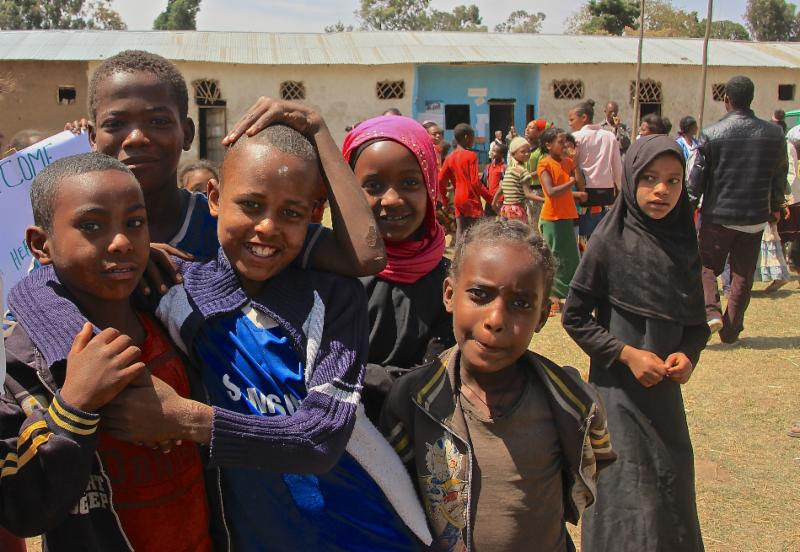 Wolde enabled us to bring water to a school of 2,500 children and the 60 families living around the school. He did this with ease, facilitating the town water board to work with us and build toilets as well. . Wolde worked with the parent committee of a rural school outside of Hosanna, monitoring and supporting the building of a new 4 classroom building block that will cut class size in half. He arranged for our visits, facilitated numerous meetings, managed funds and worked with all stakeholders to enable us to work together to accomplish all that we did. It is hard to imagine all the things that Woldeamanuel has done. It would make a very long list. What always amazed me was how he would think of the perfect solution to everything that we were working on. Here are 2 examples. We would bring funds to the US and they would be managed so that there was a committee of parents, town education personnel, school principal, student, and Woldeamanuel. But to pay for the construction the checks would have to be signed by 3 people so all funds were well monitored. Wolde's idea. Or when we had a big celebration of the opening of the library, we invited the principals from every school in the town, high schools and private schools. Now the library is filled with students from all the schools of the town. Wolde's idea. I could go on with examples. But the most astounding aspect is that Wolde volunteers his time to make all these things happen. His generosity of spirit, his commitment to the people, and his talent and skills make me so grateful that he has agreed to be our country representative. We are hoping he will be coming to our benefit on August 2 and that others can get to know this amazing man.